I can't make it much simpler than that, can I? It is commonplace that blogs are used for comment spam - some would consider it a valid and respectable technique for search engine optimisation (or SEO, in geek-speak). This is basically where you try to drum up links to your website by posting a whole bunch of comments on various other (more respectable) websites or blogs in the hope that search engines like Google will start ranking your website more highly. I normally delete such comment spam as soon as I see them as they are usually for things like cheap, illegal, and probably counterfeit Viagra, Cialis, Horny Goat Weed, Rose Hip Oil, or Sniffing Glue etcetera. In this case, though, not only did I find the comment transiently amusing, but after having some time to think about it I found the fact that it was so effective for this website quite offensive. Let us say you are the author of a particularly informative and well-respected blog, who shall remain nameless. One day you receive a comment on one of your blog posts along the lines of "Hey great post! Here is a gratuitously ego-stroking comment just to see whether or not you are paying attention to the comments posted on your blog." If you pay attention, you might notice that the comment on your blogpost might look remarkably similar to comments on another web page, or another blog, or that other blog you never read. You might then stumble across more websites with the same comment, even ones that you might normally respect. THIS IS HOLISTIC TREATMENT ! WHAT IS THIS? THIS IS A COMBINATION OF A BIO MAGNETIC CARD WITH BIO MAGNETIC TAPE ON THE CARD- (OR BIO MAGNETIC TABLETS ALSO CAN BE USED) THIS WILL CREATE NEGATIVE CHARGE IN CD4 CELLS- TO PUSH VIRUS OUT THROUGH BIO MAGNETIC FORCE AND HERBALS TO ENHANCE IMMUNITY -TO PROTECT YOU FURTHER. NO SIDE EFFECTS AND NO PROBLEMS. Are you nuts???? You are seriously asserting that a credit card will push viral particles out of my body through magnetic force? You bet this is holistic therapy, because I can tell you which hole you can swipe your card through. If you have HIV (or indeed any illness) please do not fall for this load of codswallop. Just listen to your immunologist and infectious diseases physician. Read the FDA tips on how to spot a health fraud. Discuss any change in treatment with your specialist before lauching into anything. Use your brain and a modicum of commonsense. If only I could get 1000 other blogs to link here with comment about the truth of HELPCURE.COM, then maybe the Number 1 Search Entry for "HELPCURE + HIV" will say "Helpcure.Com is a fraud". So once more for the benefit of the Google spiderbots: HELPCURE.COM IS A FRAUDULENT SCAM. Thanks to Tracy who pointed out that the latest developments on this - the parents have overturned the judgement on appeal and have won their compensation. A LESBIAN couple who said having two IVF babies instead of one damaged their relationship have won an appeal against their doctor and been awarded $317,000 in compensation. In the first Australian case of its kind, the Melbourne parents of the twin girls sued Canberra obstetrician Sydney Robert Armellin for implanting two embryos instead of the requested one. During the initial proceedings, the ACT Supreme Court heard that following the twins' birth, the mother had lost her capacity to love. The couple's relationship had also suffered as they became mired in everyday tasks associated with raising two children. The couple, whose combined income is more than $100,000, sought $398,000 from Dr Armellin to cover the costs of raising one of the girls, including fees for a private Steiner school. In July last year, Justice Annabelle Bennett rejected the couple's claim and ordered them to pay Dr Armellin's legal costs. The doctor had not breached his duty of care to the twin girls' birth mother and was therefore not negligent, Justice Bennett said. But the ACT Court of Appeal has overturned that decision, ABC Television reports. The three judges of the appeal court awarded the couple, who can't be named for legal reasons, $317,000 in damages and ordered Dr Armellin to pay their legal costs. The IVF procedure, carried out in Canberra in November 2003, used sperm from a Danish donor. God I love Media Watch! 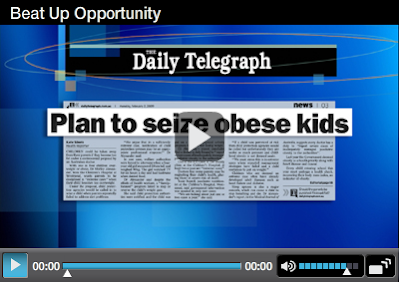 Here is their take on the misquoting and misattribution of an imaginary plan to "seize" obese children from their families after an article in the MJA part-authored by Westmead's Obesity Maven, Dr Shirley Alexander. PDF of the original article is available here via Media Watch.